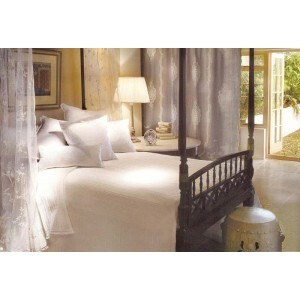 Thanks to the soft grey fabric, the intricate design on this Genoa bedspread sest won'.. The Cocoon Geometric pattern makes a bold modern statement. A luxurious gold colour palette is en..
A quilted patchwork quilt with handworked ruffle using stripe and floral patterns with colour com..
A beautifully designed bedspread with a wonderful ditsy and delicate floral pattern made up of pi.. Snow white quilted bedspread. This collection provides an absolutely stunning showpiece bed setti..
With it's beautfiully embossed design, this cream cotton !00% bedspread has a luxurious texture a..
Base Fabric: Quilted Metallic linen (100% linen) Lining: off white cotton sateen (100% cotton.. Striking patchwork printed quilted design in red, white and blue checks and stripes with stunning..
Cotton bedspread in stunning stars and stripes with a bold blue border. 100% Cotton. Machine ..
Base Fabric:Taupe crushed velvet (55% cotton 45% viscose) Fully reversible: ecru antique velv..
Jades rich duck egg blue jacquard design is decorated by a delicate floral pattern. This luxuriou.. 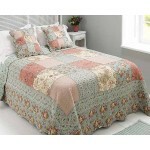 Magnificent pure silk gold hand quilted bedspread available in any of the silk shades Size Ki.. 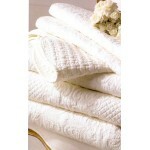 Magnificent pure silk ivory hand quilted bedspread available in any of the silk shades Size K.. Magnificent pure silk pewter hand quilted bedspread available in any of the silk shades Size ..
A wonderful Patchwork Style quilted bedspread with beautiful, ditsy and delicate floral pattern d..
Just as versatile as white but a little more forgiving, this oatmeal tone will work we..
A wonderful industrial chic patchwork style bedspread. The combination of stripes, checks an..
New contemporary quilted bedcover and pillow sham made from 200 thread count yarn dyed cotton. 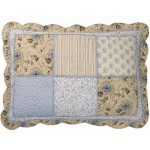 Al..
Pillow sham quilted to match quilted bedcover made from 200 thread count yarn dyed cotton. All ov.. This softly textural jacquard weave is patterned with an elegant floral trail. 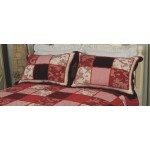 A beautiful soft c..
Sophisticated rich reds and burgundys in florals and pin stripes make up this high quality patchw.. Pretty pink floral prints combine springtime classic, at excellent value. A printed fabric on rev..
New cream and light blue colourway with ruffle detail in handworked patchwork pillow sham. 100% c..
A bold design with a contemporary sense of style, featuring luxurious jacquard woven fabrics, tri..